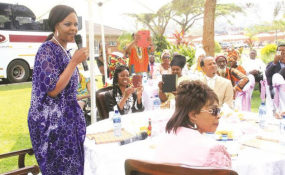 Former first lady Grace Mugabe in Mazowe in October 2017 with Women Affairs, Gender and Community Development Minister Nyasha Chikwinya and a visiting delegation of United Kingdom-based businesspeople. Despite a court ruling ordering the state to compensate them Mazoe villagers whose properties and homesteads were destroyed by the police insist that Grace Mugabe is still their number one enemy, adding that she must apologise to them in person. Since last year, the villagers have had running battles with the heavily armed ZRP officers who were evicting the resettled farmers from Arnold and Manzou farms on former First Lady's orders. The villagers were illegally evicted from the two farms and dumped in the bush along Mvurwi-Concession road and left for dead by ZRP officers. When the court gave them relief they went back to build makeshift houses but they were again destroyed and burnt on orders from Grace Mugabe. Many court orders were ignored. The two farms became inaccessible as police officers and some Zanu PF supporters erected boom gates at every entry into the properties. Last Thursday, the Bindura Magistrate Court ordered Home Affairs Minister Obert Mpofu and the ZRP Commissioner-General Godwin Matanga to pay more than $30 000 as compensation to the villagers. When the NewZimbabwe.com news crew visited Manzou Farm a day after the court ruling, the villagers said no amount of money would ever be enough to compensate them the agony they went through in the past years. They said in as much their issue was highlighted in the last few years, their anguish started the day Grace landed in Mazoe to lay the foundation for her vast empire. "The government and Zanu PF leadership stopped giving us presidential agricultural input saying Amai said you are occupying her land," said King Maposa (71). "From that year our lives became horrible and unbearable." Maposa added, "Only from two years ago when the police started demolishing our houses and lawyers took that to court that's when the world got to know the cruelty of Grace Mugabe." One Takaitei Chigayo said the last two years they have been living in the nearby Mazoe mountain as Grace's 'law enforcement agents' persecuted them every day. "Every day, early in the morning, together with my children, we had to go high up the mountain to hide, as police haunted us, destroying our homes and property." Another villager staying in Arnold farm houses built by the former white commercial farmer said Grace forced and ordered them (four families) to share one house each. "She took over most of the houses and gave them to her workers, and even told us to stop farming," said Chigayo. "But since the end of last year some of the workers left one by one as they are no longer employed by Grace and we have since grabbed our houses back." Chigayo added, "If she can't come in person she must send the same people she used to torment us and say I am sorry, we have no problem with the former president Robert Mugabe, but his wife." All the villagers who spoke to NewZimbabwe.com said if Grace had conscience she would come and apologise to them. They said if she doesn't she will remain their number one enemy. They all described her as a "selfish woman" who doesn't care about ordinary citizens yet she "acted" and "talked" like a "saint". At one point, the affected farmers approached the African Union and SADC to intervene in their plight.